Are you feeling relaxed after the weekend? If you’re like me, I surely could use an extra day… all weekends seem to go by way too fast. If you feel the same way, this new “Beautiful Home of Instagram” will bring you right back to weekend! 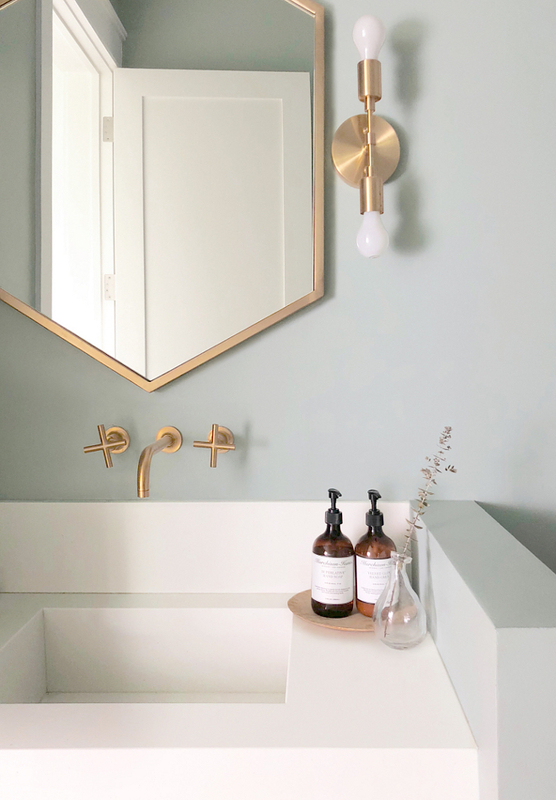 Before we start talking about this house, I need to say that if you’re on Instagram you need to start following Caroline Kilmartin of @caro_kmartin – her home feels like breathing fresh air or walking on a sandy beach. 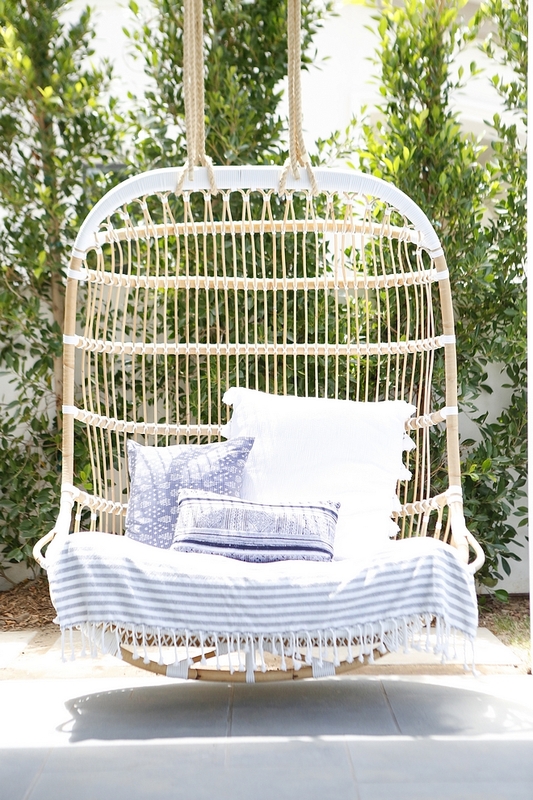 Its coastal vibe immediately relaxes you and calms any stress level. 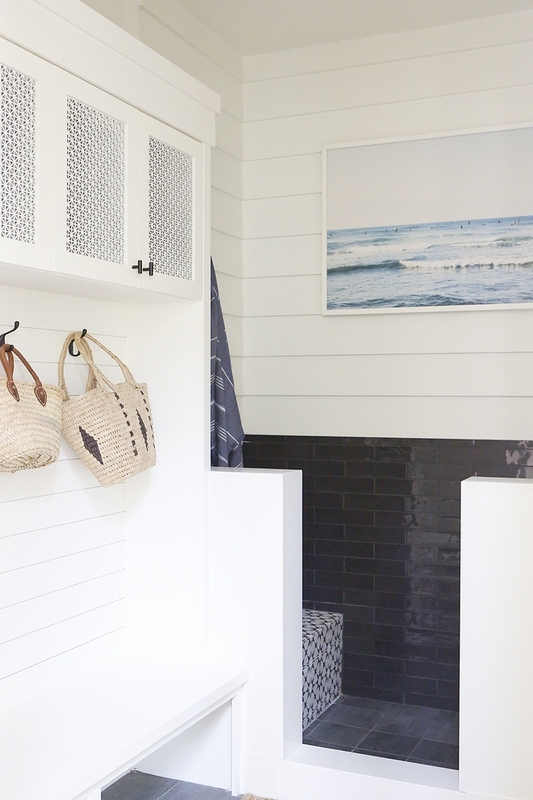 Here, the homeowner shares more details of her newly-built California beach house. “I was pregnant with our first child when my husband and I decided we needed a larger space to fit our growing family. 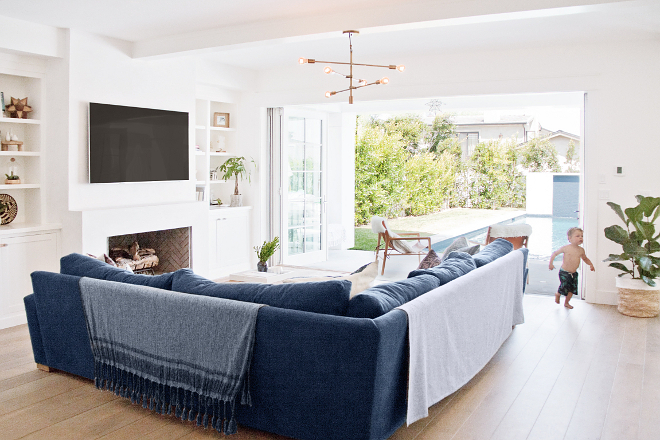 After searching tirelessly for a home in our area, we decided to build a house in Manhattan Beach, California. Our architect, Joyce Flood, helped us develop the layout and my sister and I did the interior and exterior design. The entire process took almost two years and while there were plenty of challenging moments, we couldn’t be happier with the results. 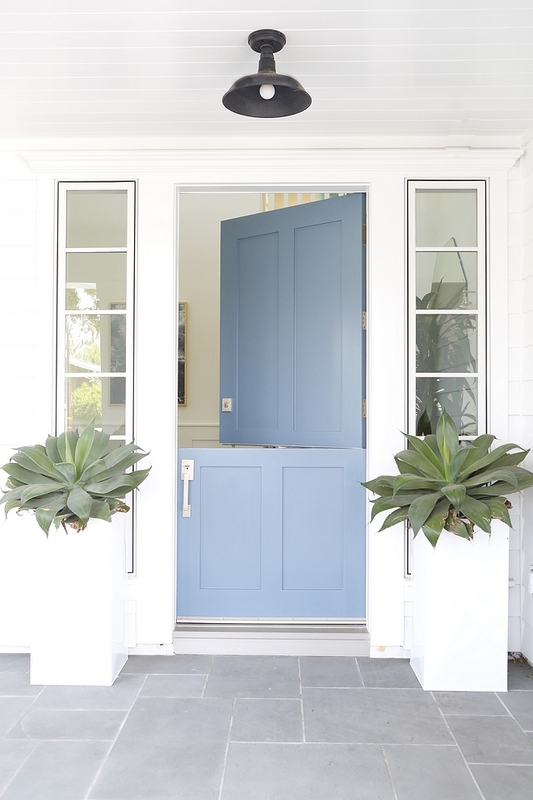 Caroline’s Dutch door features a blue-gray paint color, Thousand Oceans by Benjamin Moore. The front porch tile is Bluestone. The foyer is two stories and has a dozen windows to allow plenty of light. Throughout the house there are lots of windows because I love having as much natural light as possible. 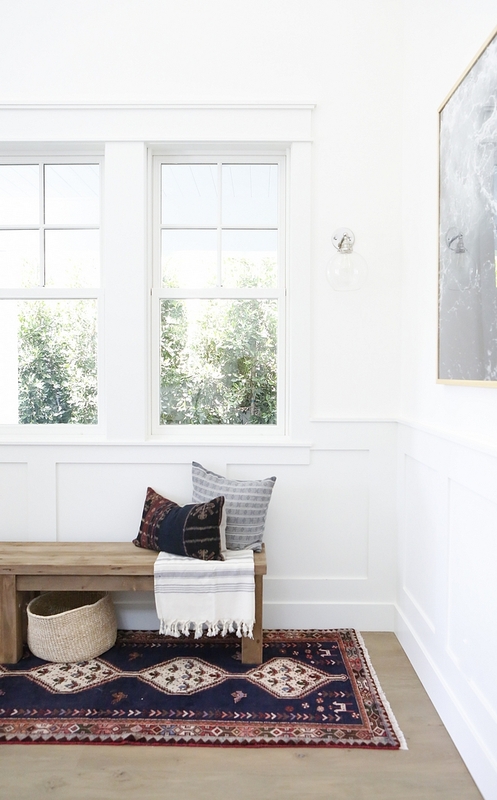 All walls, unless otherwise stated, are painted in Simply White by Benjamin Moore. Similar Bench: Here, Here, Here & Here. We created a formal dining space but still wanted it to feel casual and warm for friends and family to gather and eat. The dining table is a 10 foot salvaged wood farm table from Restoration Hardware with a large coco bead chandelier on top. 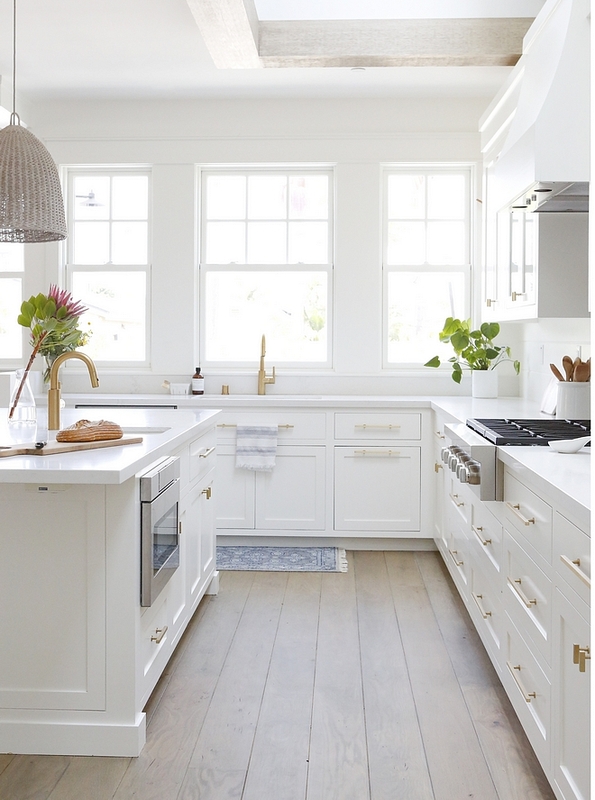 Custom built-in cabinets painted in Simply White by Benjamin Moore add plenty of storage for servingware. The dining chairs are from Lulu & Georgia. 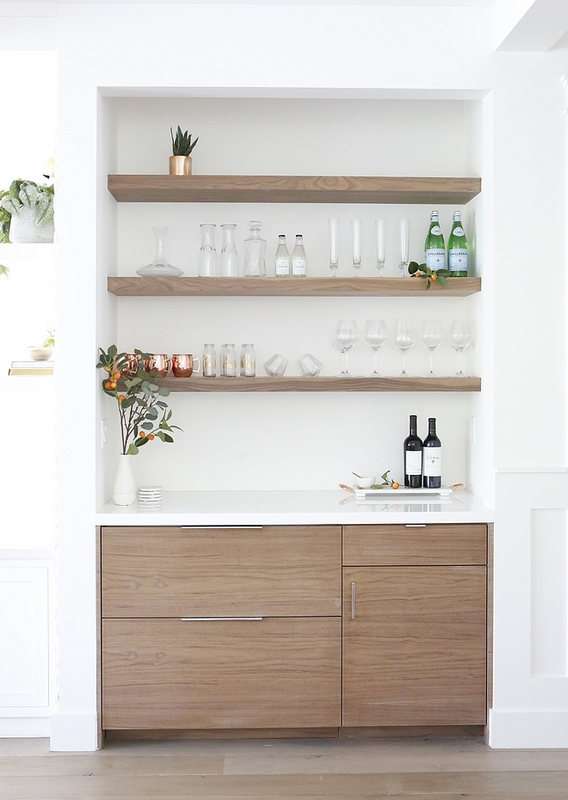 In between the Kitchen and Great Room, we put a beverage bar with a built-in drawer fridge to store drinks. The cabinets are custom built with a walnut wood and a glass countertop. We used open shelving above in matching walnut wood to display glassware. 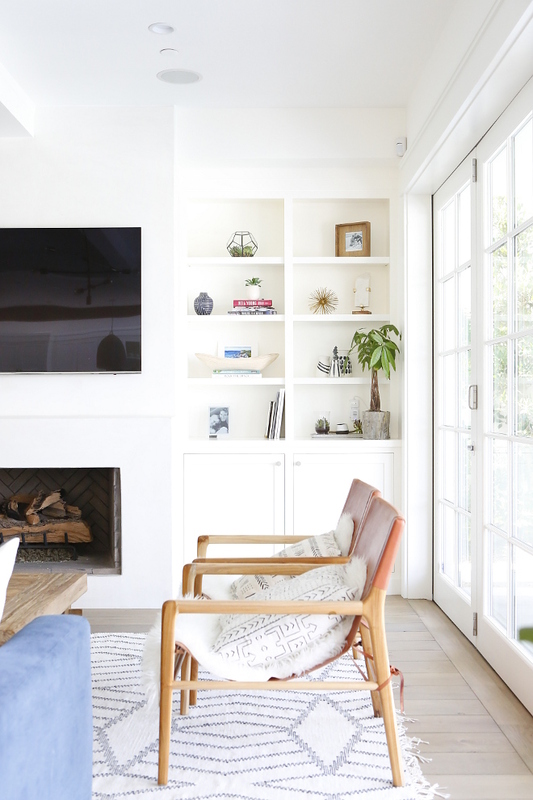 This is where we hang out the most in the house – where we cook and eat, lounge on the sofa, watch TV, and where the children play. We wanted this area to be large and open with plenty of windows looking out to the backyard. 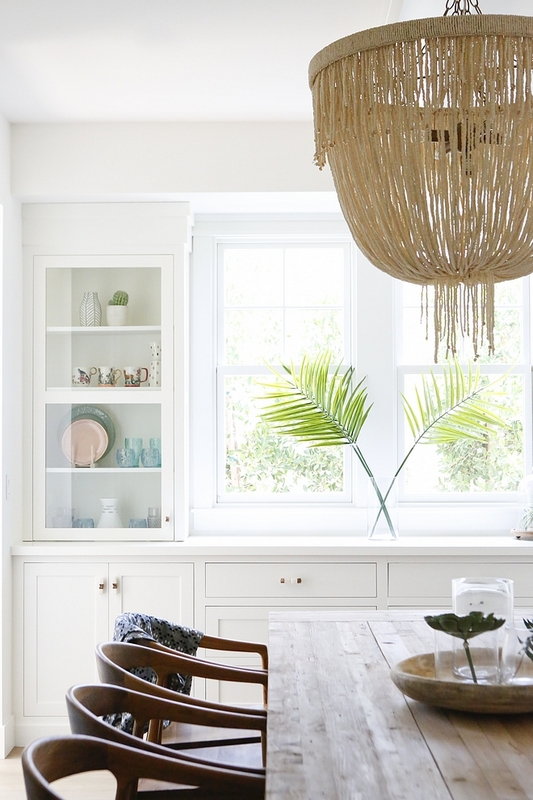 The rattan pendant lights over the island add a little coastal feel. 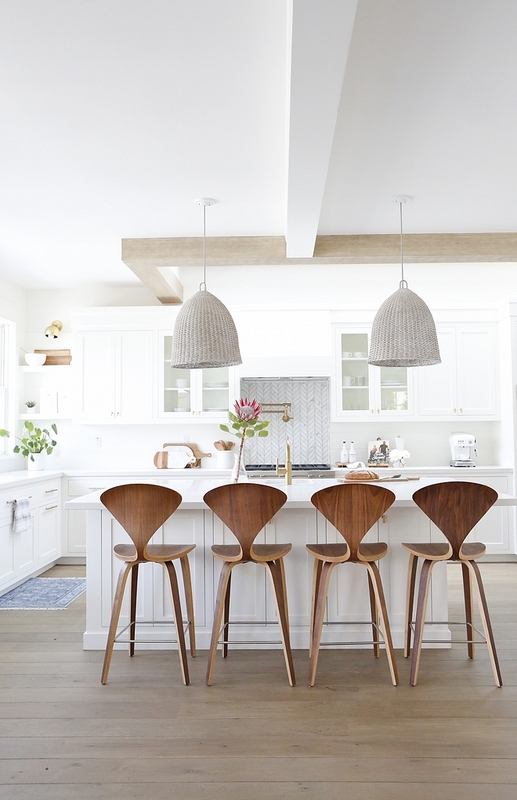 Similar Pendants: here & here. I loved the idea of a breakfast nook where we can eat our breakfasts and weeknight meals together. This one is surrounded by windows with a custom built walnut table. We made the back cushions from scratch. We put an 8 foot island in the center of the kitchen and skylights above to add natural light. The backsplash is subtle with waterproof shiplap, except for above the stove where we put Walker Zanger’s Tangent Calacata Apex marble. Counterstools: Nuevo Satine Counterstool in Walnut. 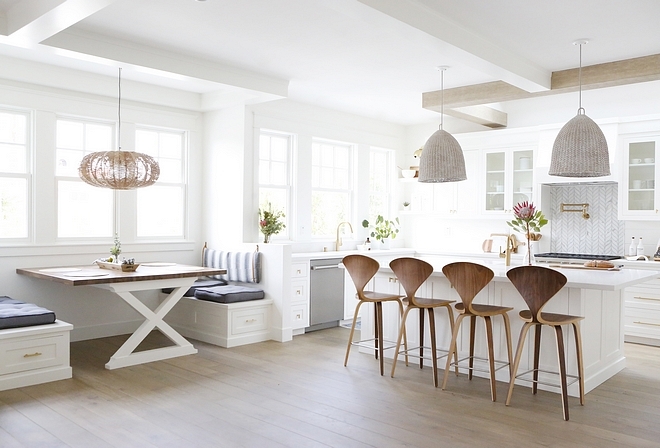 The cabinetry was custom built as framed inset and painted Simply White by Benjamin Moore. Faucets: Newport Brass Kitchen Faucet & Bar Faucet – similar Kitchen & Bar Faucet (Great quality but more affordable). The appliances are Wolf and the countertops are Calacatta by Caesarstone which have a nice soft marble pattern. 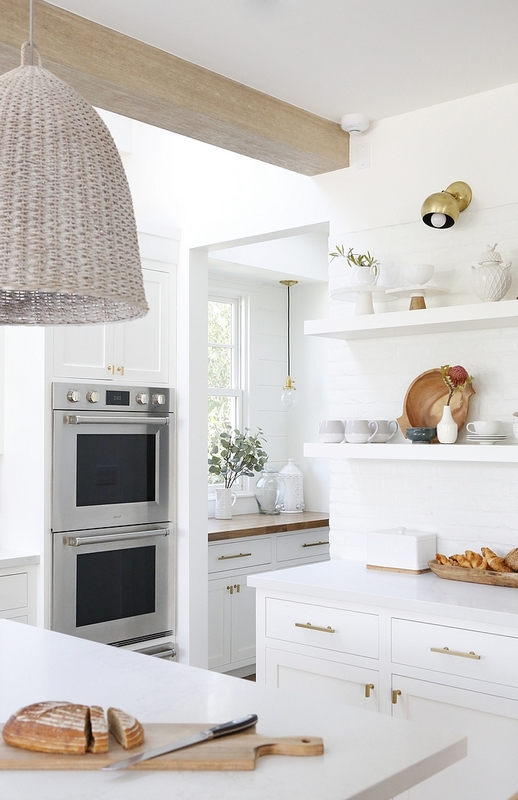 On one side of our kitchen and surrounding the built-in fridge/freezer are open shelves with white painted brick to add some texture. Just behind that wall is a walk-in pantry with open shelving and across from that is the butler pantry with a walnut wood countertop. Similar Sconce above Shelves: Here. Since we couldn’t get an ocean view property, we created our own water view by placing the pool in front of the great room and adding folding glass doors that walk out onto the pool area. The sofa, from RH (similar here, here, here & here), is large and comfortable to fit plenty of family and friends. I wanted the feel of a real wood burning fireplace but I also wanted it to look clean and modern. So we put a custom built gas fireplace with a herringbone brick pattern inside and used clean white lines on the face. 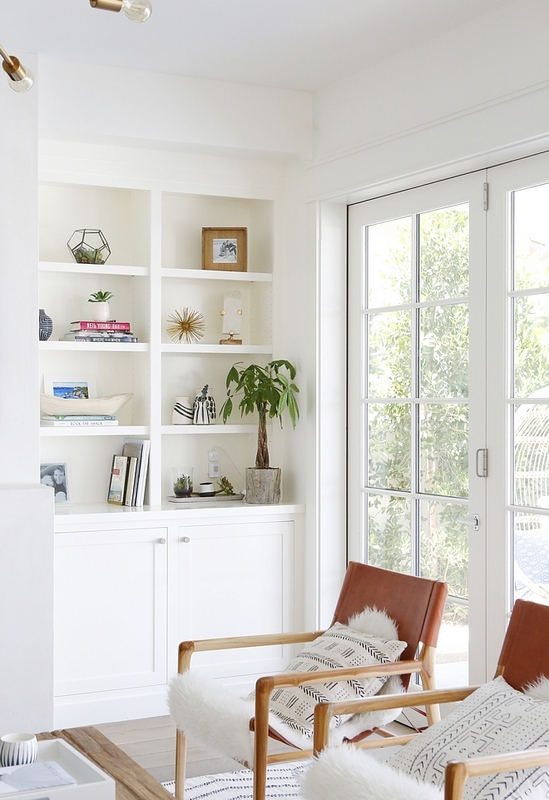 We added two Swedish leather sling chairs as an accent. Similar Chairs: Here, Here, Here, Here (not in leather), Here, Here & Here. We also created a small area for the kids to play and read in which includes a daybed and buffet console to store toys. The Powder Room is small so we didn’t want any large overbearing vanities. We had one custom built from Caesarstone’s Concrete quartz which was made to look like one large slab of concrete. The walls in this room are painted Kensington Green by Benjamin Moore. The wall faucet is from Kohler’s Purist collection. To the side of the foyer and connected to our garage is a mudroom to store our shoes and coats. We also added a “doggie shower” which we use to rinse off when we come home from the beach. With two kids, this little shower is a huge blessing. The bottom half of the shower is tiled with Alyse Edwards Tongue in Playing it Coal (similar here & here) and the top half has a white waterproof siding. We added a little bench in the shower with Atlas II tile. We decided to add a little pop in the laundry room with Medina Grey cement tile from Overstock. 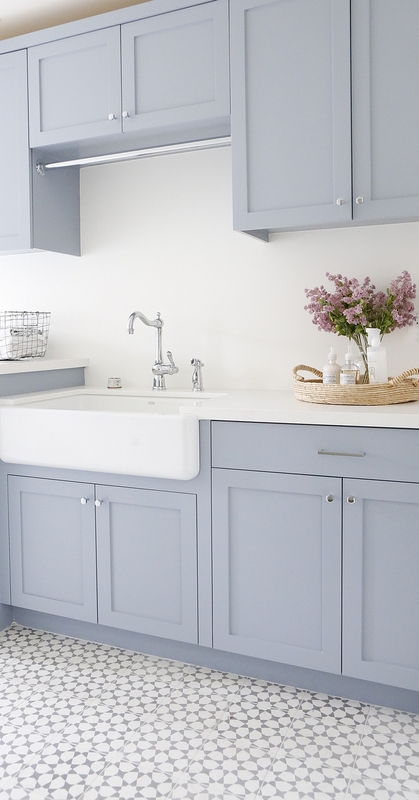 The cabinets are custom built and painted in New Hope Gray by Benjamin Moore with a large farmhouse sink and Pure White countertops from Caesarstone. We host many guests throughout the year so we wanted to create an inviting and comfortable guest room with a fireplace and private bathroom. 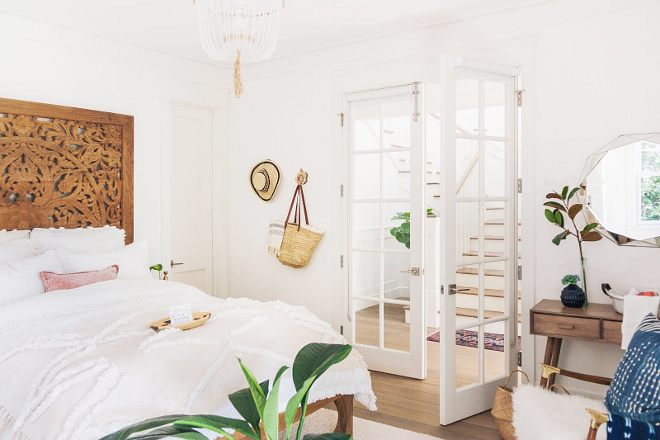 The bed from Anthropologie is the main piece and I love the mango wood design. 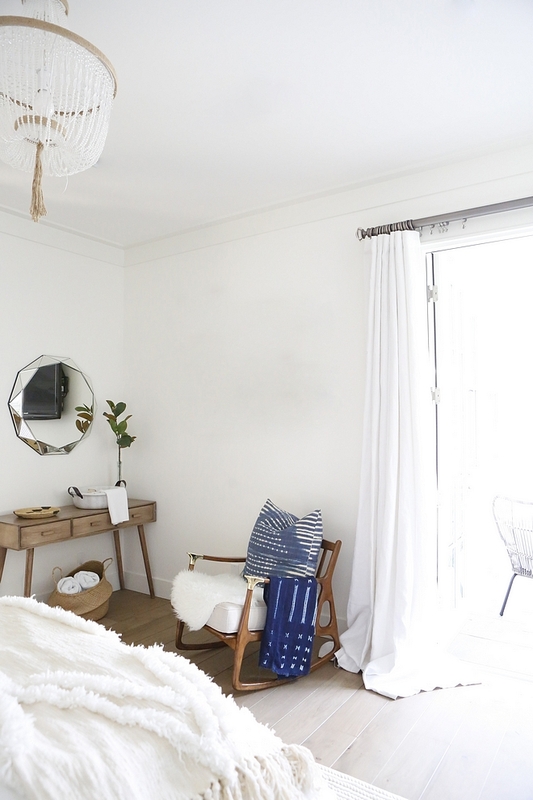 White Interiors: I was nervous about going all-white but, am so happy we went with it—it makes every room lighter and more inviting. 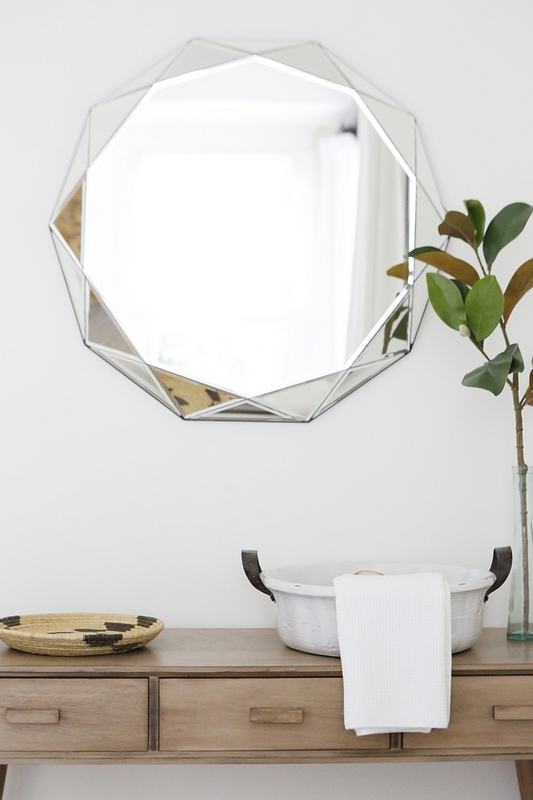 Faceted Mirror: West Elm (no longer available) – similar here, here, here & here. 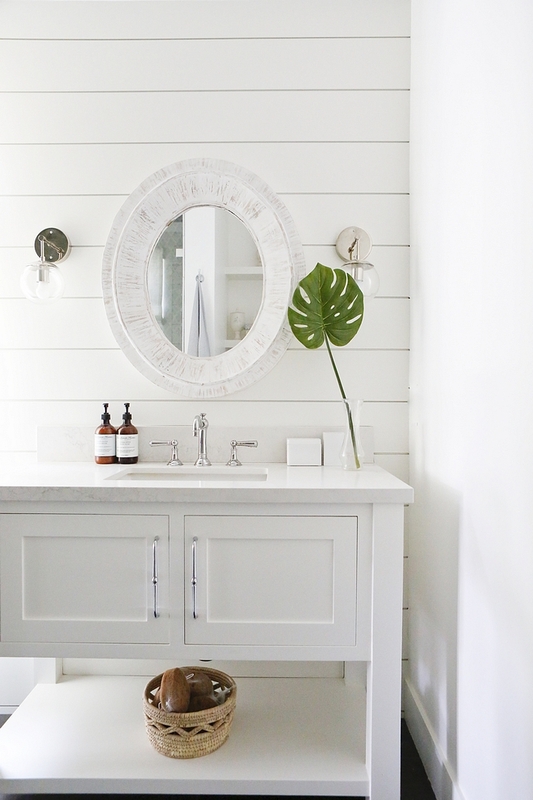 The bathroom has shiplap on the wall, Calacata Nuvo countertop by Caesarstone and a custom built vanity painted in Simply White by Benjamin Moore. This is a jack and Jill bathroom that will be for one of our children in the future. We kept it clean with all white tiles and mixed it up with the patterns. The shower is Walker Zanger’s 6th Avenue Cocoon Mosaic (similar here, here & here) and the floors are a small hexagon porcelain tile. We added a freestanding bathtub (Rachel tub from Wyndham) for those bath nights for the kids. 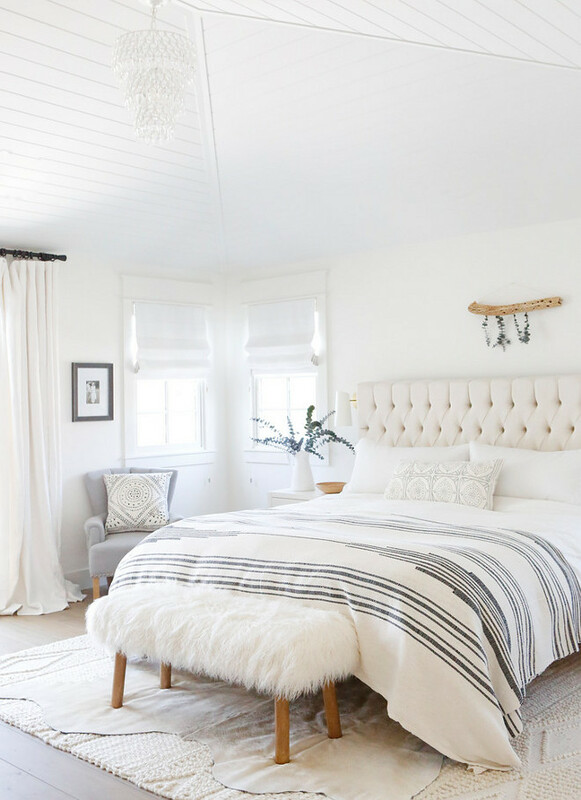 The Master bedroom looks out onto our backyard and has vaulted tongue and groove ceilings for added height. Bed Lumbar Pillow: Serena & Lily. Chair Pillow: Serena & Lily. The floors here and throughout the house are a French Oak wood with a custom stain. Rug is from Serena & Lily. 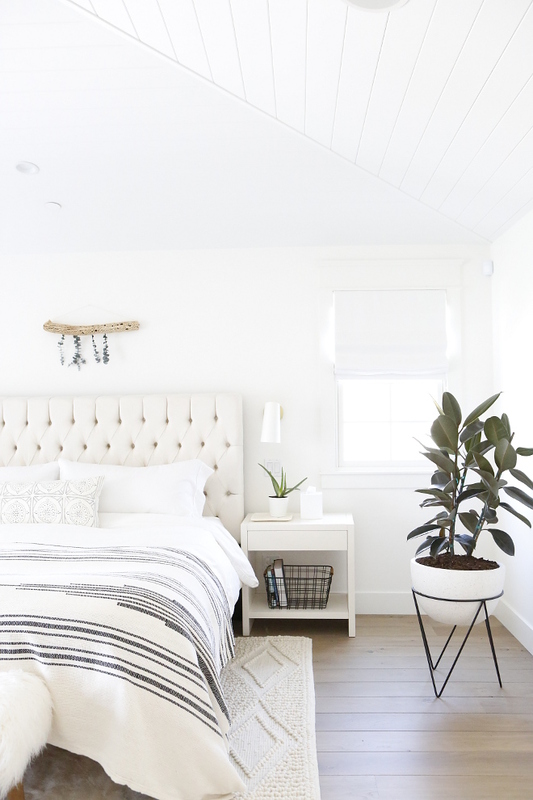 Similar Headboard: Here & Here. 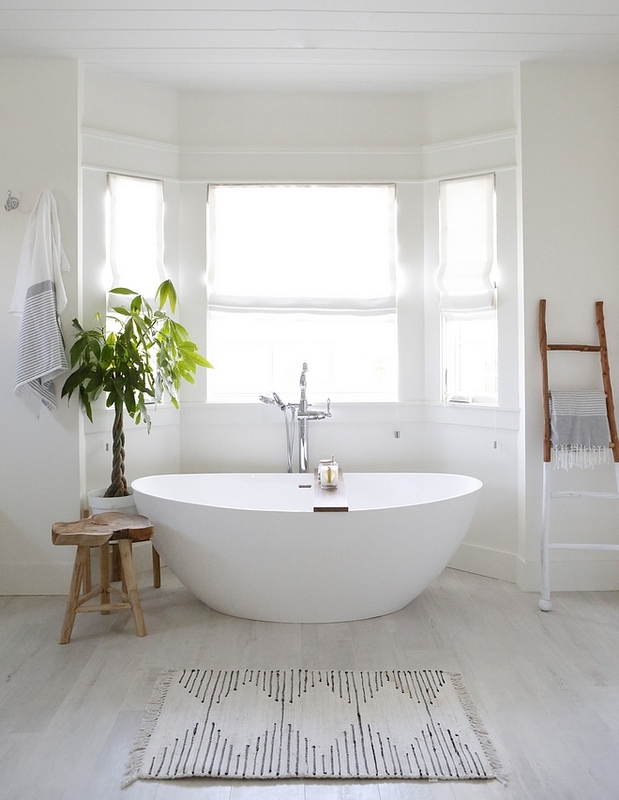 In the bathroom, we put a bay window for the freestanding bathtub. 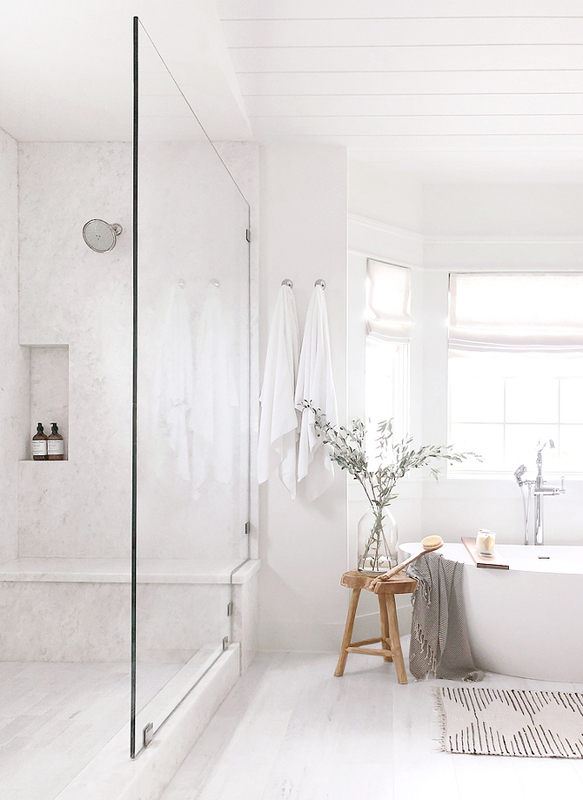 We used large slab Opal White marble for the shower. The ceilings are also vaulted here with tongue and groove detail and a wooden beam running through the middle to add some warmth and texture. 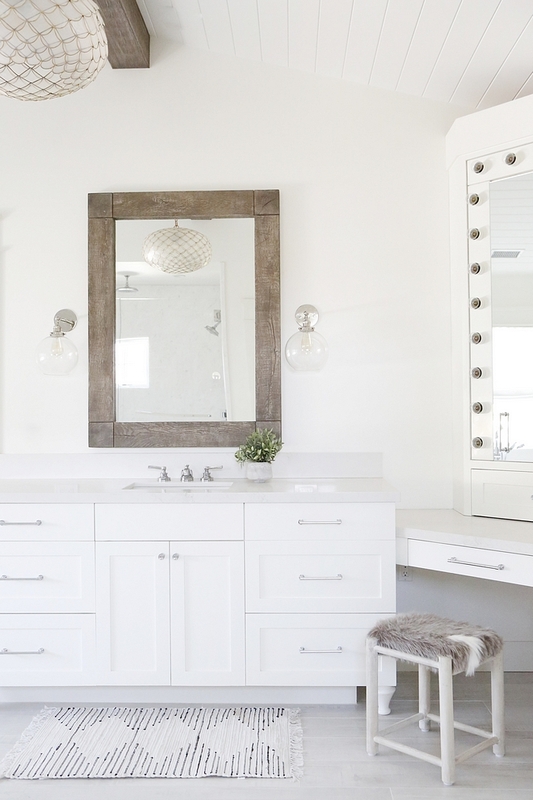 Similar Reclaimed Wood Mirror: Here. The homeowner’s backyard is truly an entertainer’s dream! Hanging chair is Serena & Lily. 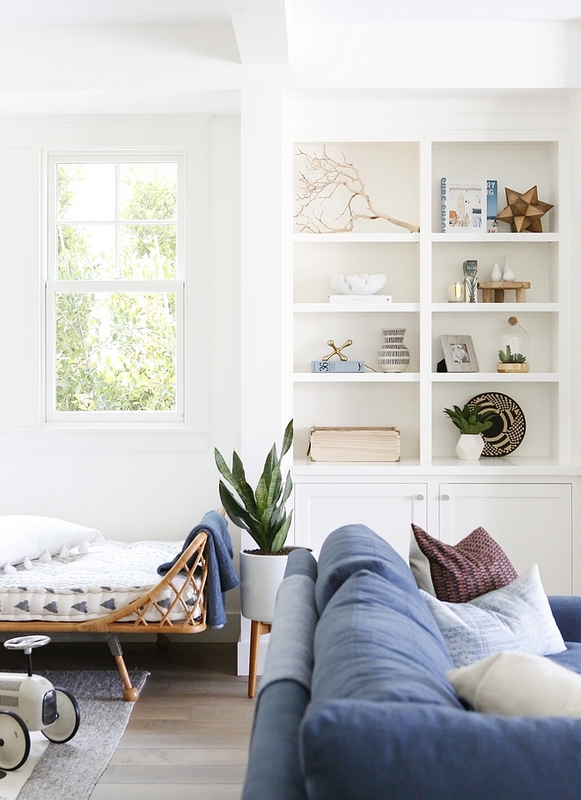 Follow @caro_kmartin to see more pictures and you can shop her home decor here. Photography (with a few exceptions): DustyLu.